DTH Service provider in India are not limited in number. The limiting factor is the knowledge of the resellers.Here is evaluation and conclusion for HD Quality. As we wrote before in details; DTH, which stands for Direct-To-Home, consists of the major component is Satellite Television. Which we think is a must read for the majority of the users. As like we said at the beginning – DTH Service provider in India are not limited in number, but there are several factors we need to consider for practical purpose, that includes the quality, the level of vendor-lock-in and another thing – who is reviewing it. My usage, My wishes might not be exactly the same like another person. I would not care to pay 2K INR for only the connection per month to get the highest quality for a 40 inch smart TV. Although I do not watch television at all, obviously I have my mother and a cousin who actually gave their opinion for the practical part – availability. I tested all mostly from Kolkata (3 services), Mumbai (1 service) and Delhi (also 1) – there should be no question of availability of service guys. Socially its a fact that I might get a bit more attention than a common man. These are points you must think apart from the technical parts we have mostly considered in this guide to choose DTH Service provider in India. There is no meaning of buying a television. Our guide for LCD Monitor as Television will make you understand that, there is no practical meaning of giving away the bigger brands 150% more than it actually should cost. But, we will tell you another way – you even do not have to buy the external TV tuner card (what ?). The buying process can make you scared because probably there is some issue with redirection towards the SSL domains. Honestly, I bought three times and all time I needed to refresh the white page after filling up the form, it actually works some how plus Rs. 500 instant back is never an unwanted part. They must make this part of online transaction better. From Kolkata I got great service. I ordered at 2 AM, received phone calls from 8 AM and within few hours they actually installed with without any demand for ‘baksish’. Its first time I experienced the ‘baksish’ part to be absent in Kolkata for installing a thing. The receiver unit (DISH truHD+ with Recorder) has a HDMI port – if you directly connect with any latest HP Computer monitor, you will need no external TV tuner card. Just change the mode to Gaming or Movies from LED’s control buttons – with good extra speakers it can make Sony to get ashamed. We tested HP’s top notch LED monitor, it works fine. HDMI Video Output need not to be processed. So, first you actually can upgrade your whole setup. It has a blocked optical interface, we guess it is for our eyes only. The onboard processor for sure is too much beaten or may be it overworks for too much compressed non HD channels. It definitely needs a fan. Do not go for local reseller, go for all online and via SMS, phone etc. Avoid the middleman. Obviously, our way of usage is to get the highest quality possible, it might not be a budget pack for you. Dish TV is from ZEE group/ Essel, obviously they will try their level best to promote their channels. Apart from English and Hindi, my need is not much for Bengali channels – I honestly do not like both the weired politics and odd sort of Bengali Mega series. But from the reports from “home channels”, they are good but obvious complain arises when you watched a HD quality video on demand 15 minutes before. They have a on car service too. So, the whole thing is great for me. Its not possible for me to buy 3 HD TV for 3 houses – Monitor way works great. We think the motion blur effect observed by few in review is due to some decoding factor. I also noticed it (strangely) on smart TV but not on monitor ! Cheaper way is better ? Other alternatives are Videocon D2H and TATA SKY. Airtel has problem with adding new channels for regional areas. I had too much faith on Reliance Big TV, but its really an average performer. Its obvious that, the Internet Service Providers can not manage this Satellite Segment rightly, although AirTel sports LTE and Satellite Internet Connection. Its a fact – DishTV have not to pay for the whole ZEE group, basically they are getting at a base price. The remote control unit of DISH truHD+ with Recorder is the worst part – the etching is bad although they tried a Apple way of designing. The unit has all possible Video Output – literally. If you are a newbie, probably you need to read about the A/V connector and interfaces. The unit get too much hot while operating. It feels like a laptop cooling pad would be its good support. We received Made in Korea model with “Not For Sale’ sticker both in Kolkata and Delhi. DISH truHD+ with Recorder needs only a modern LED Monitor and Speakers apart from normal TV setup. Connect the HDMI port of DISH truHD+ with Monitor’s one. Obviously there will be no sound. You will need either a 5.1 or 2.1 audio units. You will use the RCA cables to connect to the audio part. Obviously, for 2.1 you will need to plug only the White and Red jacks not the Yellow one. Buy a External USD hard drive or a higher capacity USD pen drive to record if you want. Yes, if WAN or LAN was supported that would be great – but Apple will release Smart TV at the end of this year for those who are looking for integrated functions and cost is a less barrier. DISH truHD+ with Recorder is neither good nor bad – its basically like inkjet printers – the cost is inside the refills. People complains about their customer care, I never have faced, its difficult to opine on that part. I guess I never went through the local reseller part, may be it has bypassed many issues. This Article Has Been Shared 7513 Times! Apple MacBook Pro 15 Inch Retina and Non Retina Excels At Quality. New MacBook Pro 15 Inch is a powerhouse deigned for the professionals like a luxury sedan. External Hard Drive Not Recognized is a quite common situation faced by many users. People blame the Operating System, scratch own heads but problem persists. When Load Balancing is Required ? When Load Balancing is Required ? How you will decide that your website or server needs Load Balancing? Number of pageviews per month does not determines it. 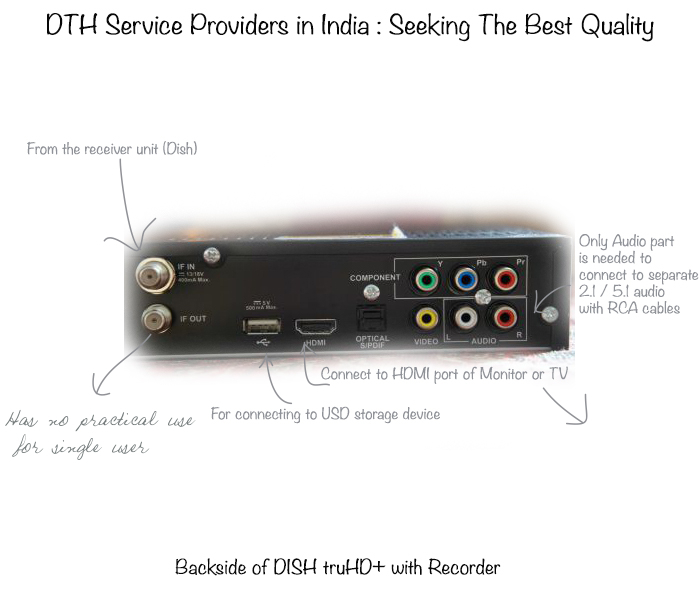 Cite this article as: Abhishek Ghosh, "DTH Service Providers in India : Seeking The Best Quality," in The Customize Windows, July 4, 2013, April 23, 2019, https://thecustomizewindows.com/2013/07/dth-service-providers-in-india-seeking-the-best-quality/.